I recently went to see Richard Montoya’s Water and Power at Teatro Vision in San Jose. I thought Richard’s writing was brilliant and can’t wait to see what further forms this story takes. After the performance we went to Iguana’s for dinner and I ended up sitting next to Richard. He started a spiel about his one man band, Stink Finger, where he plays the drumsticks. 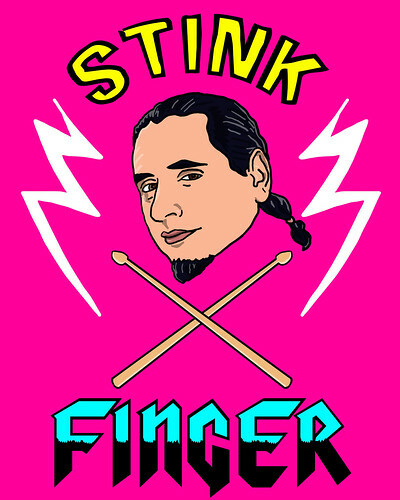 I told Richard I’d design a Stink Finger logo for him. The dangerous thing about two artists joking around is that they are often capable of following through with their ideas and ridiculous promises. Below is the logo I came up with that very night. After our meal Richard treated the crowd to an impromptu Stink Finger performance in the parking lot. Richard let his hair down, flanked by staff members of Teatro Vision, and rocked out. My video evidence is below.